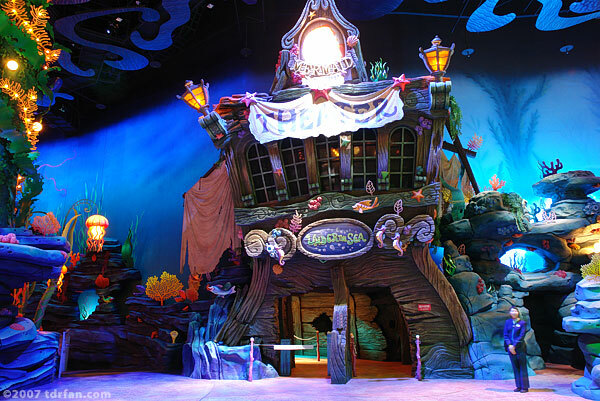 The Mermaid Lagoon Theater is, for me, the highlight of the Mermaid Lagoon area of DisneySea. Inside is a show called "Under the Sea" that recreates scenes from the movie The Little Mermaid. The show itself is hard to categorize (other than to call it a "musical"), and is probably unlike anything you've see before. It's a combination of live performers, large-scale puppets, and audio animatronics. The theater itself is circular, which means every seat in the house is a good one. Although there is a stage in the center of the theater, the action happens around and above you, as Ariel (i.e., The Little Mermaid) "swims" around the theater with the help of a flying-wire device (think Peter Pan the Musical happening above your head). The parts of Ariel's undersea companions (like Sebastian the crab) are provided by large scale puppets, animated by puppeteers that practically wear the puppets. It's a little odd at first (the puppeteers are fully visible but wearing black garments to help them blend into the background), but you quickly learn to ignore the puppeteers as the puppets themselves seem to come alive. I've always liked the music from The Little Mermaid, and the music here is faithful to the original movie. Although the soundtrack is pre-recorded (for obvious reasons), it's still wonderful to see it being presented in a live setting. Whether or not you are a Little Mermaid fan, this show is really something special. The queue lines here can be long during the day, but tend to get shorter at night, and as this is an indoor show it doesn't really matter what time you see it. If the lines are long, come back later in the day—it's worth it.